Puts the power of PURELL®, America's #1 instant hand sanitizer, in an advanced non-aerosol foaming formula. PURELL Advanced Instant Hand Sanitizer Foam kills more than 99.99% of most common germs. Patent-pending 70% ethyl alcohol formula is free of fluorinated chemicals, and milder on skin than hand washing. Thick, rich foam formula stays on your hand. PURELL Advanced is enhanced with four different skin-conditioning agents that help maintain skin health—skin moisture and improves overall skin feel. 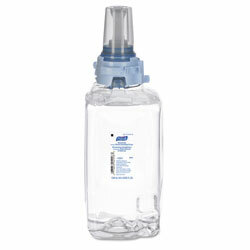 PURELL® ADX-12™ Dispensers. Hand Sanitizers Type: Liquid; Color(s): Clear; For Use With: PURELL® ADX-12™ dispensers (sold separately. ); Capacity (Volume): 1,200 mL. Hand Sanitizers from Purell! 497 In Stock today.